REVIEW: 'Wonder Wonder' #2 by Greg Rucka, Nicola Scott, and Romulo Fajardo, Jr. 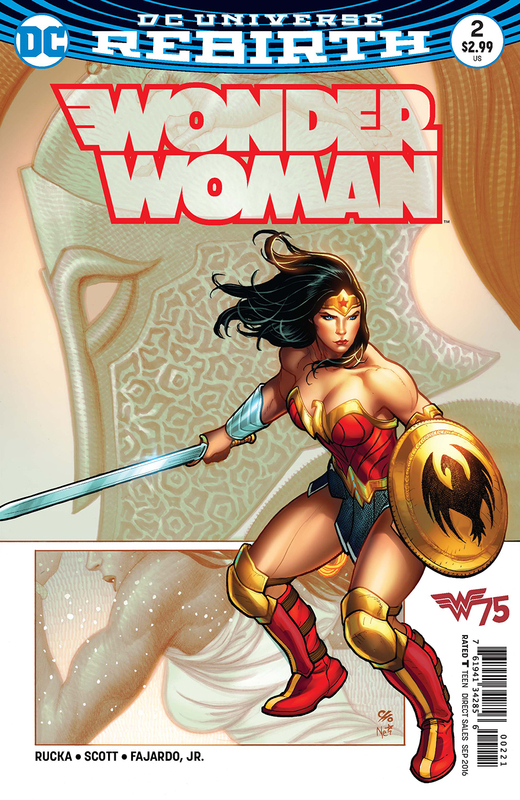 It's only fitting that during the 75th anniversary since William Moulton Marston created the iconic Amazonian princess, Wonder Woman is getting the royal treatment from DC Comics. With already an Earth One volume by Grant Morrison and Yanick Paquette released, a digital-first series from Renae De Liz and Ray Dillon completed, and now a bi-weekly on-going "Rebirth" series from Greg Rucka and a team of top-shelf artists, Diana Prince is can't-miss entertainment. Wonder Woman #2 introduces the "Year One" storyline to go along with the alternating "The Lies" story that started in issue one. Nicola Scott and Romulo Fajardo, Jr., take over the art duties from Liam Sharp and Laura Martin giving "Year One" a look all its own. Sure, Rucka revisits a young Diana and Steve Trevor's arrival to Themyscira but it all feels fresh under the expertly rendered illustrations of Scott. Unlike the last series of the New 52, Diana looks realistic and youthful without appearing plastic and dead in the eyes. It's one of the highlights of the issue the way Scott evokes so much longing, wonder, and joy from Diana's face. The young princess looks to the horizon instead of the stars curious to see what exists beyond the island. It's a recurring distraction for her as she studies and trains to be the warrior we all know she'll become. Her story is intertwined with Steve's as he prepares for a mission. Rucka alternates their stories even on the same page implying a shared fate which we know leads to their first meeting. We get some background on Steve that gives what happens later in the issue more emotional impact. It's a story we think we know but Rucka is able to draw out more details and explore relationships of Diana and Steve in more meaningful ways that feel true to the characters. As brilliant as Scott's pencils are, Fajardo's colors light a fire to the page. It's coloring as perfect as you'll ever see. The moon's glow on a hilltop, the gradient colors in a field of grass, the warm orange glow from firepits, all cast a realistic shine and warmth to the landscape. An array of skin tones are well represented also on the island. Scott and Fajardo create a diverse population of women in age, size, and appearance. Fans of Wonder Woman deserve quality like this on a regular basis. Thankfully, we get Rucka, Sharp, Martin, Scott, and Fajardo every two weeks to fill our desire for sharply written stories and industry-leading art. One of the most iconic heroes of all-time warrants nothing less. As tone deaf as DC Comics can be with some of their decisions, I can say they are doing Wonder Woman justice with this creative dream team.